Graham has a hammer and everything is looking like a nail and he tells us why (14:00). Nick tries to talk him down from his issue with materials by suggesting a variety of solutions for different usages. Sometimes it’s better to think of a design as a series of elements that gets built up into a whole instead of a single element that is constructed for the single purpose (25:45). Ethan Moses has come out with a new 4X5 hand camera, the Cameradactyl OG (cameradactyl.com) and Graham and Nick each have one from the first batch and they talk about its structure and materials (28:15) as well as how to extend its usefulness and functionality. Graham comes up with the absolute worst idea for making an optical lens (31:15) while Nick talks about more difficult methods that might actually work. One of the battles we have to fight as designers of cameras is keeping the film flat against the film gate. To help with that, Graham proposes reducing the area of the image size (49:00). Nick brings up the concept of making mini bellows focusing mechanisms (58:00) as a method of saving weight through the elimination of the helical. The Cameradactyl OG is discussed in length again (1:00:00). Please excuse the rustling in the background as both of the hosts have their cameras in-hand during this time. Graham harkens back to the Starship Enterprise for inspiration for a light-shading device for viewing the ground glass even though Nick doesn’t want to think about it. Just like a cuckoo bird laying an egg in another bird’s nest, Nick and Graham discuss an interview conducted on the Classic Lenses Podcast (https://classiclensespodcast.podbean.com/) with Raffaello Pondri of the PONF camera (ponfcamera.com) project (1:24:30). The PONF camera is a design that features swappable film and digital backs on a 35mm camera. It is well worth a direct listen instead of relying on the shaky memories of Nick and Graham. The manufacturing process would use a metal 3D printing system like this one https://www.youtube.com/watch?v=Igq8gQuXfR4. One of the most interesting of the concepts that came up in the discussion of the PONF camera is the use of an LCD shutter (1:42:15). They are plentiful and cheap but that doesn’t mean they are right for film photography. They move on to what they’ve been working on lately (1:51:00), including the adapting of lenses, more about lumen boxes and issues with Graham’s 3D printer. Graham incorrectly identifies the supplier of lenses as Surplus Shack while it is Surplus Shed (surplussed.com). Shout out to Matt Melcher of the Box of Cameras podcast and poster on Flickr (mattmelcher) and Instagram (@mattmelcher and @box_of_cameras). 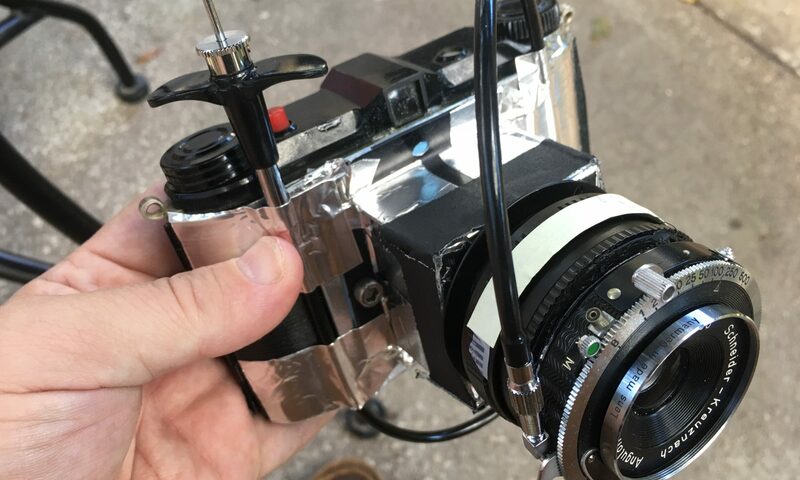 Graham has some cameras for sale on Etsy (https://www.etsy.com/shop/FrozenPhotonCameraCo) and thinks everyone should own one of them.